3184 Surfers Paradise Boulevarde, Surfers Paradise, Queensland, 4217 Australia. Circle on Cavill, in central Surfers Paradise, introduces the very best in Gold Coast inner city living with spectacular resort facilities. 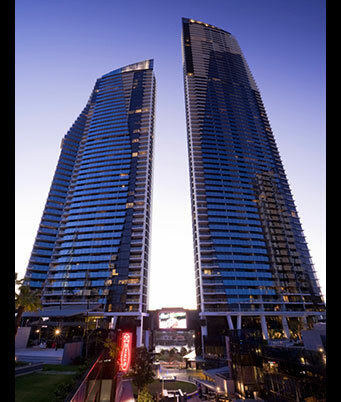 Circle on Cavill is located in the brand new precinct in the heart of Surfers Paradise off Cavill Avenue. The resort consists of 2 towers, with the tallest reaching 69 storeys into the sky. This brand new resort offers stylishly appointed self contained apartments with magnificent views stretching from to Stradbroke Island in the north, the Burleigh headland to the south, the Gold Coast hinterland to the west and of course the gorgeous Pacific Ocean to the east. At Circle on Cavill take advantage of a wide range of resort facilities including a modern outdoor pool, lap pool, undercover heated lap pool, state of the art gymnasium, in-house cinema, viewing deck over the Circle on Cavill retail precinct and meeting rooms. Circle on Cavill offers a luxurious new level of holiday accommodation on the Gold Coast with one, two and three bedroom apartments. Circle on Cavill’s extensive facilities including a recreational outdoor pool, heated lap pool, gymnasium and private theatrette combined with the its central Surfers Paradise location provides the ideal setting for a Gold Coast holiday. With direct access to numerous boutique and designer stores, as well as a wide range of restaurants and cafes, Circle on Cavill offers something for everyone. Accommodation at Circle on Cavill, Surfers Paradise includes spacious one, two and three bedroom apartments, with many offering panoramic ocean or hinterland views. All apartments feature modern décor and offer spa baths and gourmet kitchens. Available with 1 Queen Bed and with view to the ocean. Available with 1 Queen Bed + 2 Singles (zip) and with view to the ocean.